Nextdata project aims to foster the implementation of measurements networks and the creation of a national system for the retrieval, storage, access and diffusion of environmental and climate data from mountain and marine remote areas, which can be easily used by both researchers and public and private users, including the manufacturing and commercial sectors. Access to quantitative information on remote regions, both mountain and marine, is crucial in order to understanding the climate and its changes. 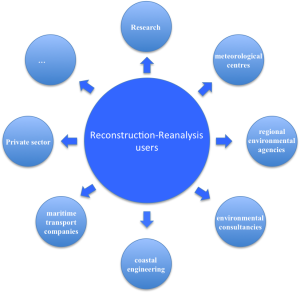 Time series for reanalysis and reconstructions are currently required by different research and institutional users (research institutions, ENI, NATO, meteorological centres, regional environmental agencies, etc.) and private companies (environmental consultancies, coastal engineering, and maritime transport companies, etc.) for the management of the marine environment, risk assessment and sustainable exploitation of marine resources. In order to reconstruct the climate signal from all existing in situ and satellite measurements, recent years have seen the development of reanalysis techniques, which optimally combine models and observations. The result is a climate reconstruction for the recent past, reflecting the best of existing scientific and technological knowledge and offer a continuous time series. Historical marine data for the Mediterranean Sea over the past hundred years are available in European databases, continuously updated by EU member countries, thanks to infrastructural projects such as SeaDataNet, EMODNET and GMES-MyOcean. What it is missing, however, is a reanalysis of these data in order to produce a complete map and high-resolution spatial and temporal climate variability in the Mediterranean. The Operational Group for Oceanography of the INGV, on the basis of past experience in the development of first prototypes of reanalysis for the past twenty years, aims to study the feasibility of and realize the first high-resolution time-space climate reconstruction of the Mediterranean Sea for the past 60 years. At the same time it aims to realize a computer system that makes it available to the scientific community and institutional, as well as to private.